Finding new solutions to the printing industry challenges started in the 1920’s for the Thibault’s family with a hard-working stone polisher named Wilbert. Since then, 3 generations later, the Thibault’s still focus on making the printing more efficient through innovation, flexibility and ingenuity. Everything to create a positive IMPACT on a printer’s business. Founded in 1982, Unigraph International Inc. has become one of the largest North American manufacturer of chemicals for the printing industry and graphic arts professionals. Reducing costs for printers to stay competitive throughout technological and market changes. More flexibility to allow printers to adapt to new challenges. Constant new product through R&D. Respecting clients, the business and the environment. Personal and highly qualified technical support. 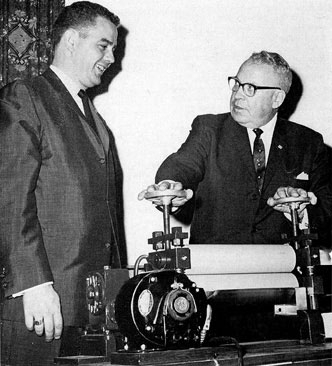 Léo Thibault (left), founder of Unigraph International and son of Wilbert Thibault (right). John Thibault (up page), son of Léo and President of Unigraph International.